Jeff, Milt, and I are a happy trio who all co-exist in the same bedroom. Jeff and I take the bed, and up until December, Milton was always in his crate. Now, he is crateless, and I think loving it... One of the main reasons for having a crate, though, is to create that den-like atmosphere where a dog feels cozy and secure. Something tells me that Milt might be missing it for that reason. 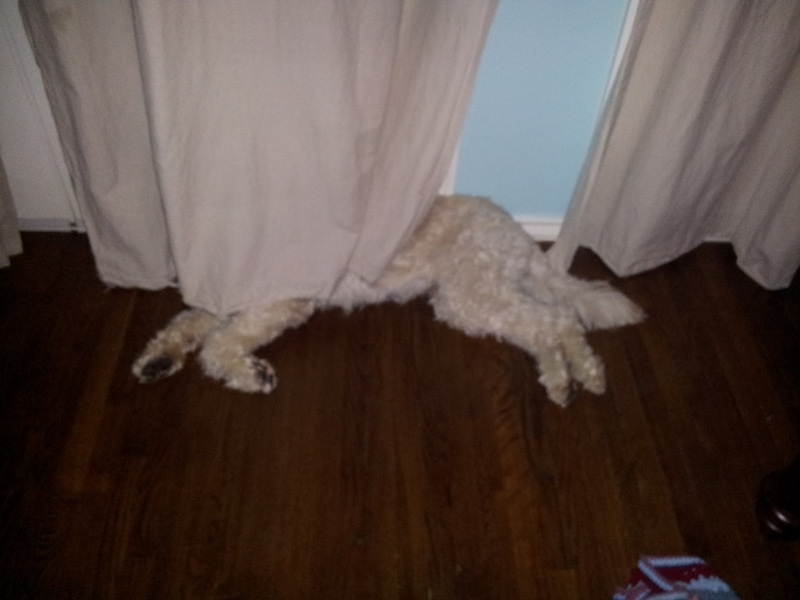 Whenever we are in bed for the night, Milt Dog likes to lie down right next to the windows and sneak behind the curtains. He tries to stay hidden and out of sight, out of mind. Perhaps it is a hint for us not to disturb him. We think it is pretty darn cute. Missed you guys this past week - severely burned my hand baking cookies last week and was unable to type. Hand hurt like the dickens but the snickerdoodles were AWESOME! hahaha I always get weirded out whenever there is a lapse in comments from you. Scary...! I hope you are beginning to feel better! What a baker.